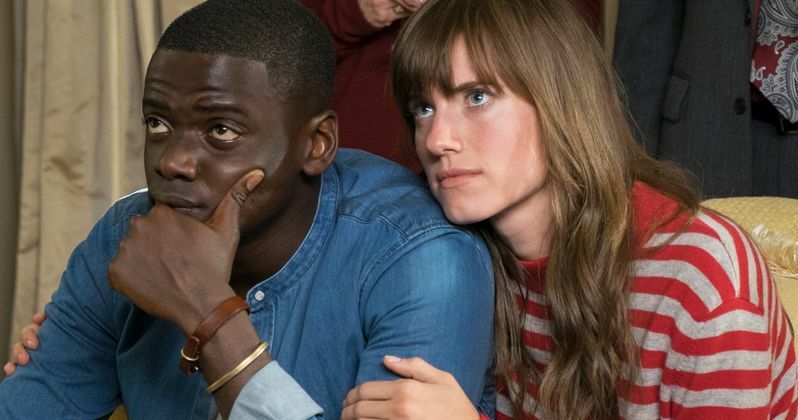 What if the psychological horror movie Get Out was actually a rom-com? That premise becomes a reality in a new video launched on MTV's official Twitter. Get Out is one of the biggest movies of 2017 thus far, grossing over $100 million on a very limited budget. And as such, it's is being celebrated as one of the best movies of the year by the MTV Movie and TV Awards. The original thriller from director Jordan Peele follows Chris (Daniel Kaluuya) and his girlfriend, Rose (Allison Williams), who have reached the meet-the-parents milestone of dating. She invites him for a weekend getaway upstate with her parents Missy and Dean. At first, Chris reads the family's overly accommodating behavior as nervous attempts to deal with their daughter's interracial relationship, but as the weekend progresses, a series of increasingly disturbing discoveries lead him to a truth that he never could have imagined. Peele's thriller is filled with some truly funny moments, all of which are utilized in MTV's mashup video. It wasn't hard to repurpose the shocking horror experience as a cute and coy romantic comedy. But we're not sure it would have made for a better movie. The MTV Movie and TV Awards are just one day away, and to help promote it heading into Sunday, Mashable's Cinefix team created this special video just for the occasion. The video turns all of the awkward moments into charming fluff, and any sinister hint of danger has been swept under the rug. Get Out has been nominated for a Movie of the Year Award, with the winner to be announced at the end of the ceremony. Get Out is currently the number 5 highest grossing movie of 2017, just after Lego Batman, The Fate of the Furious, Logan and Beauty and the Beast. It is nominated alongside Beauty and the Beast, Logan, Rogue One and The Edge of Seventeen. Allison Williams also picked up a nomination for Best Villain in Get Out, with Daniel Kaluuya getting a Best Actor nomination and Lil Rel Howery getting nominated for Best Comedic Performance. Daniel Kaluuya got a second nomination in the Next Generation category, with Daniel Kaluuya & Lil Rel Howery nominated for Best Duo. Get Out is also nominated in the Best Fight Against the System category. The MTV Movie & TV Awards airs Sunday, May 7 at 8 p.m. ET.